Palomar San Diego and Shorebreak Hotel in Huntington Beach are feeling festive over Feb. 29. Staying at the Shorebreak Hotel in Surf City USA on Monday, Feb. 29? Rates are starting at $29. Dig a suite? Those are $229. CIRCLE THE DATE: We don't typically grab a red pen and circle an empty date on the calendar, one that lacks appointments or must-dos or special events. (And how much we actually grab red pens and paper calendars these days is another topic, though many of us remain devoted to the classic way of time-keeping.) Here's a riddle though: Why would you circle an empty date? For what reason? It might be your birthday, yes, because we humans have a charming way of noting our birthdays on our own calendars. But it also might be February 29, a date chock full of lore and rarity and a bit of calendar-cool cachet. We want to mark it, remember it is coming, and even if we don't have plans, we want to make some. A few hotels and destinations around California are helping us out on the Leap Day front, in terms of filling it up with something pretty nifty, and helping us to save cash while we do so. Look to Kimpton Hotels, which is offering a pair of Monday, Feb. 29 deals at properties in San Diego and Huntington Beach. IS THE NUMBER "29" INVOLVED? You guessed it: It very much is. But it doesn't apply to the rooms, right, as in rates beginning at $29? Hold up right there: It actually does. 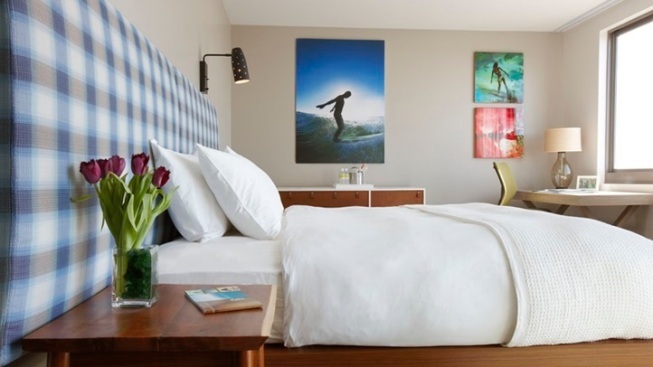 Quite often when "29" comes into play it won't cover a stay, but at both Palomar San Diego and Shorebreak Hotel in Surf City USA, that's the kick-off point for room rates. The Shorebreak is also serving up suites for $229, if that's your pleasure, while Palomar San Diego has a few add-ons at that price point, including a "60-minute spa treatment at Nature's Spa by Jurlique" for twenty nine bucks as well as other goodies tagged at that amount. The package at Palomar is called S'Leap, Spa and Dine for $29, while you'll just need to inquire after the Leap Day package at Shorebreak Hotel. Sunshine, surf-close stays, and savings on the last day of February? Which just happens to be that unusual extra day? It feels special enough to circle on the calendar, whether anything is currently penned in on February 29 or not.